A colleague’s husband’s sister can make a person fat, even if they don’t know her. A happy neighbor has more impact on happiness than a happy spouse. These startling revelations of how much people truly influence each other are revealed in the studies of Drs. Christakis and Fowler, which have repeatedly made front-page news nationwide. Their work shows that six degrees of separation is a notion of the past. Now, there is what Christakis and Fowler call the “Three Degrees Rule”—individuals are profoundly influenced by people up to three degrees away from them. 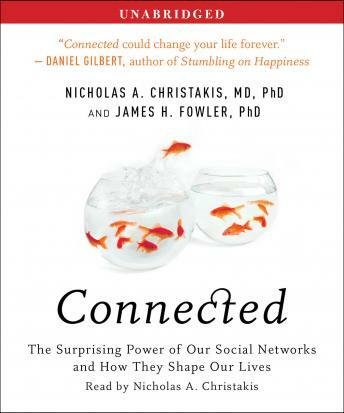 In Connected, the authors explain why emotions are contagious, how health behaviors spread, why the rich get richer, even how people find and choose their partners. Intriguing and entertaining, Connected overturns the notion of the individual and provides a revolutionary paradigm—that social networks influence ideas, emotions, health, relationships, behavior, politics, and much more. Connected will change the way listeners think about every aspect of their lives. boring, only begins to sum it up. Initially I was thinking ok, so this guy will lay out his idea/ theory/concept, and then move on to applying it... only he didn't. it was one theory, followed by another theory, followed by another. And he isn't all that interesting to listen to either! I admit, the first 3 tracks were remotely interesting, and the others, well the snowy, curvy roads I was travelling on were a godsend. I even forgot to change cds occasionally, listening to the blissful silence. I did try to suffer through, and finally cut it short in the middle of the last cd.